The International variants of the Google Nexus are getting poised to receive an OTA update of Android 4.2 Jelly Bean with some users in Canada and other neighboring areas reportedly getting it as we speak and some of them have already received it. Apparently Google didn’t waste any time in rolling out the update which was initially supposed to come bundled only with the new range of Nexus devices which got launched today but it now seems that the Galaxy Nexus users would have something to cheer about as well. Currently the update has come only on those devices running on stock Takju and not on any other carrier versions which means that the owner’s of Sprint, Bell and Verizon would have to wait a little bit longer to get their hands on the new and improved update to Android’s already successful mobile OS. The update not only improves performance and stability, it also brings with it some amazing new features including the all new Photo Sphere camera mode, Day Dream feature which are basically customizable screen savers and a lot more. So guys what are you waiting for ? 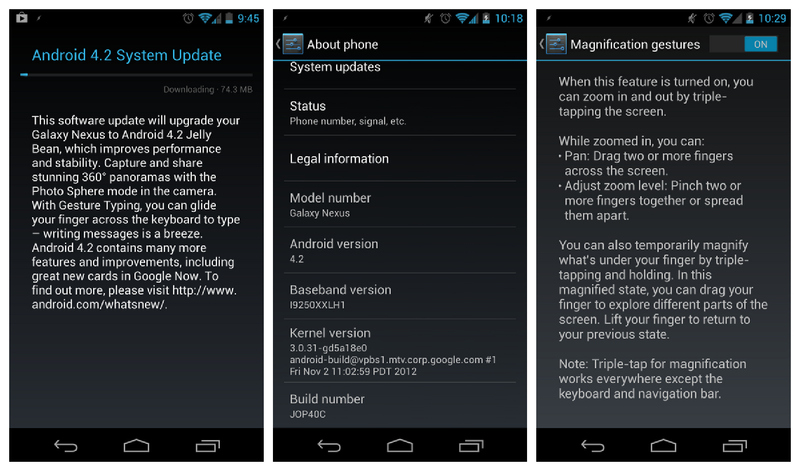 If the update hasn’t automatically started to roll out to your Takju running Galaxy Nexus, you can manually download from here.